When next you visit Marrakech look out for The Seven Saints, seven three-story towers located on the outskirts of the city that bear the tombs of seven saliheen (righteous men) from the 12th to 16th century. 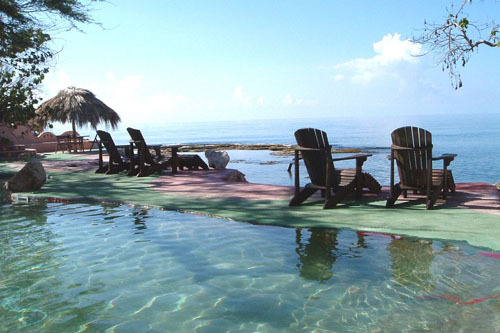 All four Island Outpost properties in Jamaica – GoldenEye Hotel & Resort, The Caves, Geejam and Strawberry Hill Hotel, Spa & Gardens have received the 2012 TripAdvisor Certificate of Excellence Award. The highly applauded award honors hospitality excellence and is given only to establishments that maintain an overall rating of four stars or higher (out of a possible five) as reviewed by travelers on TripAdvisor. Approximately 10 percent of establishments listed on TripAdvisor receive this prestigious award. The accolade comes as no surprise as Island Outpost hotels have long been recognized by travelers worldwide as remarkable properties with exclusive accommodations, unsurpassed service and top-notch amenities. Each Island Outpost property has its own singular sense of style – GoldenEye offers laid-back luxury on the north coast, The Caves in Negril feels like a secluded castle set above a vibrant town center, while Geejam in Port Antonio is a secret hideaway infused with a cosmopolitan vibe and the newly-renovated Strawberry Hill offers a cool refreshing escape 3,100 feet above sea level in the Blue Mountains. For more information and summer offers visit, www.islandoutpost.com or call 1(800)-OUTPOST. ﻿Located in the heart of one of the world’s most famous coffee-producing mountain ranges, Jamaica’s Blue Mountains, Strawberry Hill Hotel & Spa opened on October 18 following an extensive refurbishment of the property. Listed in the New York Times #1 bestselling book, 1,000 Places To See Before You Die, Strawberry Hill is 3100 feet above sea level and features one of the most awe-inspiring views of the Blue Mountains in one direction as well as the city of Kingston in the other. On a clear day, one can see up to 40 miles from the property’s infinity-edge pool, and at night the city far below becomes a twinkling mirror of the night sky. The refreshed accommodations feature the property’s original antique furnishings, fully-restored, including romantic canopied four-poster beds, solid mahogany desks, and ornate hand-carved fretwork. Brand new soft-finishes round out the update with exquisite, hand-dyed linens by Royal Hut. The spa, a focal point of this high-up hideaway, specializes in stress-relief, body and soul rejuvenation, and wellness activities. Whether it’s a nature-curious guest wishing to explore, or one looking to get the blood pumping with an outdoor workout, Strawberry Hill’s lush surrounds provide the ideal playground for both. On offer are hiking trails of varying intensity, grounds that are considered the most exotic tropical gardens on the island that include an organic coffee farm, and the opportunity to see most of Jamaica’s 26 beautiful endemic species of birds. The exciting new menu at Strawberry Hill’s beloved restaurant features a fresh take on classic Jamaican culinary favorites, highlighting the influence of the island’s multi-ethnic heritage of East Indian, Spanish, British, African, Chinese, and Lebanese settlers who have called Jamaica home since the 15th century. The organic fruits, vegetables, meats, and poultry used in Strawberry Hill’s kitchens are sourced from the property’s own gardens and Chris Blackwell’s personal farm, Pantrepant. Chefs now also serve up delicious local dishes prepared with traditional pimento-infused techniques, using the new stone grill on the property’s main lawn. Channeling the hotel’s rich music history, acclaimed DJ and Quango label founder, Bruno Guez, produced all new musical playlists for the public spaces that perfectly match the vibe of this cool high-altitude escape. iPods with pre-loaded Bruno Guez playlists are available for guests during their stay. Nightly rates start at $235, plus tax and service. From now until December 15, guests who book three nights will receive a complimentary de-stress spa treatment per person. Valid for travel completed before December 19, 2011. For more information visit, www.islandoutpost.com/strawberry_hill or call 1.800.Outpost. Spend the day in heavenly bliss beginning with an intimate couples massage in the Aveda‐concept spa. Stroll through the lush tropical gardens or take a dip in the plunge pool and enjoy a delicious 3‐course lunch on the terrace of the Great House. Price: US $300.00/JM $25,500.00 Available February 11th ‐14th. A Romantic candle light 3‐course dinner on the terrace of the Great house. Gaze at magnificent views of the city skyline and Blue Mountain range with a canopy of stars shining overheard. While you dine on Strawberry Hill’s fabulous international‐Jamaican fusion cuisine, listen to the sensual and soulful sounds of Harold Davis. Price: JM $5,900.00 + 10 % Service charge and a glass of wine per person. BREW LOVE THIS FEBRUARY AT JAKES! Book a minimum of five nights, and receive a special Romance offering, consisting of the following: ‐ A romantic turndown, which includes petals, candles, wine and petit fours ‐ A two for one dinner either in your cabin or at the exclusive Bushbar ‐ with a champagne aperitif ‐ A moonlit rafting tour of the Blue Lagoon ‐ A bottle of wine ‐ Transfers to and from Kingston Airport, if required Terms and Conditions: Period of stay February 10th to 25th 2011. Book by February 14th. where should the royal lovebirds honeymoon? These two got engaged on a Kenyan safari, so we’re sure the honeymoon will be equally as cool and unique. Here are our picks for the Royal Honeymoon. The private isle is the ultimate place to hide away from the cameras and unwind after all of the pomp and circumstance of a royal wedding. Royal Treatment: Rent out the COMO Shambhala Cottage for a night of Champagne, spa treatments, and candlelit dining. Let loose after escaping to the beautiful Mexican Riviera hotel and test tequilas recommended by the resident tequila sommelier. Royal Treatment: With Mayasutra, newlyweds can get intimate with a Moonlight Tantric Yoga class and a couples massage instruction session followed by 30 minutes of “alone time”. No stranger to celebrities, the luxury property was originally a residential recording studio where the likes of No Doubt and Amy Winehouse laid down some tracks. Royal Treatment: Stay at the amazing Sanwood villa designed by British architect Anthony Wade in the 60s and relax in the private pool or bask in the Jamaican sun and take in the views on the sun deck. 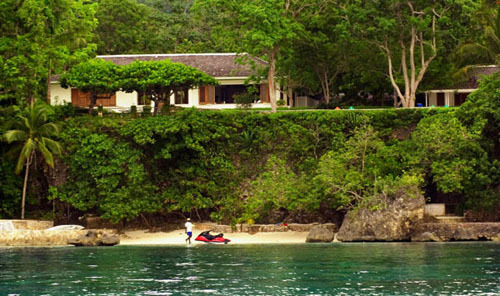 Next to the man in line for the throne, James Bond might be the most enviable Brit we know, so vacationing at this Jamaican hideaway where Fleming penned all the Bond books would be quite fitting. Royal Treatment: Stay in the Fleming Villa for a private beach and the spirit of James Bond lingering in the air and compelling the swilling of shaken-not-stirred martinis. Dodge the paparazzi at the romantic Caribbean resort where couple feeling like a dip can leap off a cliff for a private swim. Royal Treatment: It doesn’t get much more private than a candlelit dinner for two in a hidden cave looking out on the water. Following in his parents’ footsteps, William would love to vacation at this mountain resort where, besides Charles and Diana, the guests list boasts Mick Jagger and Bob Marley. Royal Treatment: Get away from the photographers 3,100 feet above sea level and take in the sweeping views from the Blue Mountains. Kick off those shoes and lose the fancy cap; this charming seaside resort is the perfect antidote to structured courtly life. Royal Treatment: Enjoy a private yoga session by starlight and listen to the waves. What’s more fitting for English newlyweds than a trip to New England? This harborside Nantucket hotel is a classic (and classy) spot for postnuptial bonding. Royal Treatment: Only on Nantucket (at Brant Point Grill) does a Bloody Mary come equipped with lobster. The luxurious Thai resort is tucked away in the beautiful Golden Triangle, away from the hustle and bustle of Bangkok. Royal Treatment: Take a romantic ride atop an elephant – sure beats a limo! After the long awaited ‘I do,’ couples can celebrate the occasion with a wide selection of live entertainment – including a seven-piece band at this Thai property. Royal Treatment: Hidden in the mangroves, the lavish villas have a 355 ft. sq. private pool, outdoor showers, and a terrazzo tub built to accommodate two (and only two). These romantic spots embody what a honeymoon should be – nothing but sun, water, sand, and a newlywed couple pampered and sunkissed. Royal Treatment: Answer to only your whims on a private a romantic island getaway with Anantara Dhigu, Veli, Naladhu, and the soon-to-be, Anantara Kihavah Villas opening in early 2011. The best part about Anantara in the Maldives is that at whatever resort couples choose to stay, free transfer is available between islands to enjoy the benefits of all. The private island resort in the South Male Atoll is just over 1000 feet long and is surrounded by pristine, turquoise water. Royal Treatment: Honeymooners get a complimentary sunset cruise with vino and an antipasti plate. No tabloid photographers here; the remote mountain lodge is a great spot from which to explore Bhutan’s monasteries and temples and get spiritually in tune before returning to palace life. Royal Treatment: After trekking through the country by bike or raft, couples can be pampered in the COMO Shambhala Retreat. The luxurious retreat set in the tangled jungle is perfect for the couple that likes an exotic locale without giving up modern comforts. Royal Treatment: The COMO Suite allows guests to have spa treatments in private in its private treatment area. Couples can sail away on a luxurious cruise to spots around the globe – no need to pick just one. Romantic “must-sees” include Rome, Mykonos, and Casablanca, to name a few. Royal Treatment: Enjoy a Couples Massage in the Feng-Shui inspired Crystal Spa or cozy up in the back row of the Hollywood Movie Theater and watch a first-run movie while sipping champagne. Here is our monthly news in tweetable form. Up up and away for #BalloonFestival! #HotelParqCentral opens on 9/23/10. Rates starting at $179/night including breakfast and other treats. #AnantaraBophut in Koh Samui, #Thailand will be getting an upgrade! And we have the pics (http://bit.ly/cSwDte) to prove it! Crowded beaches… Sun-burnt skin… Sand in inappropriate places… Sigh. Ditch the hand-held fan and take a detour from the average getaway this summer with an unexpected vacation. Bundle up in the southern hemisphere and experience Australia and Argentina’s winter season, discover the cool misty air in Jamaica’s Blue Mountains, or take in the beauty of the snow-capped peaks in India. With the weather warming up, it’s time to head to the farmer’s market to indulge in the season’s finest locally grown produce. But what happens when we eat out? With the growing trend of on-site herb and vegetable gardens, restaurants and hotels are turning over a new leaf and guests are reaping the benefits with fresher food, straight from the garden. In the middle of bustling Chicago, NoMi has created a garden sanctuary. Its lush landscaping sits on the seventh floor of the Park Hyatt, affording diners dramatic views of the city. At night, soft candlelight makes this urban oasis the perfect spot for sharing small plates and sipping carefully crafted cocktails. With summer coming up, NoMi has created a tomato-inspired menu with dishes like BLTs with vine ripened tomatoes and caprese salads with colorful heirlooms. Chef’s pick: Composition of Heirloom Tomato with buffalo mozzarella, shallots, and Chianti vinaigrette. Along with savoring the delectable cuisine of Chef David Daniels, guests at TOPPER’S get an extra fresh flavor note from the herbs gathered in the chef’s own garden. Chef Daniels keeps a plot of parsley, sage, rosemary, and thyme growing right outside The Wauwinet. Diners who opt for the more casual TOPPER’S Deck get a primo view of Daniel’s little Eden, so they can be assured that the seasonings are fresh and those basil leaves resting atop the spaghetti pomodoro were just plucked from their stems moments before. Chef’s pick: Simple Spaghetti Pomodoro, with chili flakes and fresh basil leaves. 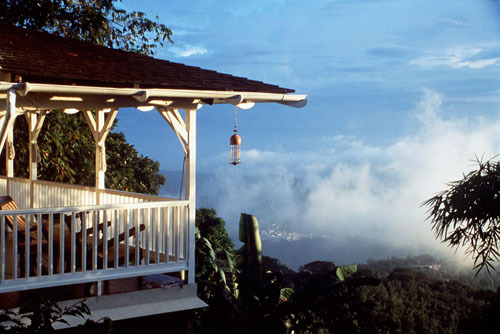 This 50-acre mountain top resort in Irish Town, Jamaica, originated as an 18th century coffee plantation. Today, the resort still boasts extensive gardens and orchards yielding copious fresh produce daily. Aromatic varieties of mint are used at the Strawberry Hill Living Spa, and lemongrass and basil spice salad dressings and teas. Bananas, pineapples, mangoes, and other local fruit grow on the property, giving guests a variety of fresh produce. Chef’s pick: Strawberry Hill Jerk Style Lamb Rack, with lamb reduction and a guava glaze. Between the luxurious ESPA and the outdoor tennis courts lies a garden replete with all sorts of herbs. By mid-May, this chef’s garden supplies the hotel restaurants with coriander, lavender, basil, sage, and others, including edible blooms like fiery red nasturtiums. Torsten Goetz tends to the garden, making sure all of those delicious flavors flourish and make it to the kitchen to spice up the chef’s cuisine. Chef’s pick: Saddle of Irish lamb with Indian spices, “Cama di rapa,” sweet and sour mango pearls, and lightly smoked lamb jus. 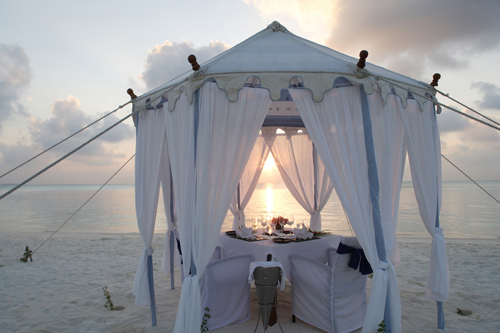 Imagine eating dinner while the wafting aromas of lemongrass and hot peppers float in the air. Now imagine this garden in paradise. At Anantara Dhigu Resort & Spa in the Maldives, guests can do just that with the addition of a new chef’s herb garden. A lone hut stands among Thai, Indian, and Maldivian chilies, wild rocket, Chinese cabbage, and other edible greenery, so locavores can rejoice in the fact that herbs and veggies are no more than a few feet away, bringing new meaning to “farm to table”. Chef’s pick: Tom Yam Pho Teak, a spicy seafood soup with fresh lemongrass and hot basil. The organic vegetable garden at Anantara Golden Triangle supplies the restaurant and on-site cooking school with fresh produce year round. The resort also organically cultivates its own rice paddy, and the rice harvested is entirely consumed at the property. Showing its green thumb, Anantara Golden Triangle uses natural fertilizer on all its crops, courtesy of the resident elephants. Chef’s pick: Thick, creamy chicken curry, filled with herbs and spices such as sweet basil and kaffir lime leaves. At Anantara Si Kao, the herb garden holds a world of local flavors. Somewhat common names such as lemongrass, Thai basil, and chili grow next to the more exotic hot holy basil, galangal, and kaffir lime. No idea how to use them? Take a Thai cooking class – each class starts in the garden, gathering herbs for the recipes. Also check out the weekly Market Night when vendors from the local Trang Market set up stalls on the resort grounds and sell their wares, including local produce, vivid spices, and even the famous Thai street food (safely prepared in the resort’s kitchens so you don’t have to worry). Chef’s pick: Pla Nueng Si Hio, steamed seabass fillet with ginger, garlic, chili, and light soy.